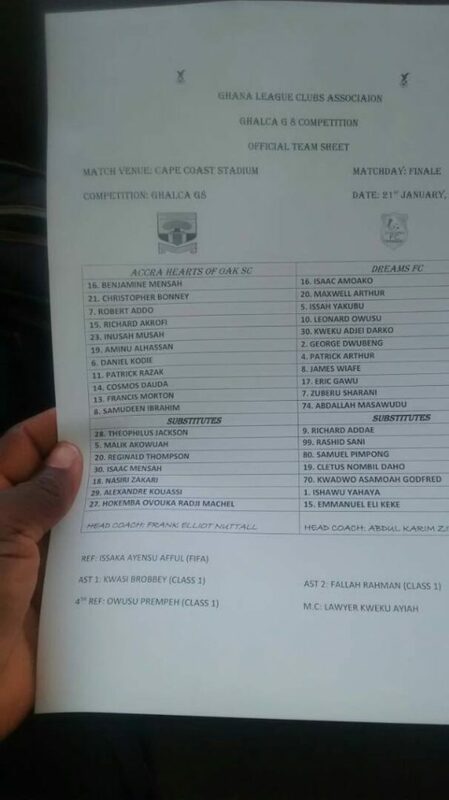 Dreams FC, after a poor start to the competition, in a 1-0 loss to Aduana Stars , won 1-0 against Asante Kotoko and a recorded a similar scoreline against Techiman Eleven Wonders in the group stage before beating Medeama SC on penalties to set a date with Hearts in today’s final clash. 03′- Dreams FC looking promising from the start but the Phobians look calm. 05′- Samudeen with a brilliant pass to Razak but he fails to control. 18′- Goal!!! Abdul Razak Cromwell restores parity for Dreams FC. Beautiful connection by the new boy. Game on! 28′- Dreams FC in control. Gawu releases a powerful drive but ball goes over the bar. 30′- Foul for Hearts. Bonney behind the ball around the center circle. S3nd a long onein buy headed away. 32′- Dreams have a free kick around the center circle. Taken but Eric Gawu pushes his marker down for an infringement against Dreams. 34′- Dreams FC keeping possession, a long one to Gawu but it’s been headed away. Hearts attacking now. 35′- Hearts attack breaks down. Dreams exerting pressure on the Phobians. 38′- Hearts of Oak coiling to defend, Dreams FC possessing to attack. 43′- Hearts forced out of their shells now. Initiate an attack but Kordie’ pass fails to read lah Dauda. Dreams FC on the break. 50′- Free kick for Hearts. Bonney behind the ball. Scuffle in the Dreams FC 18-box. 51′- Bonney with an excellent kick but Amoako pushes it over the line. Orner for Hearts. 55′- Leonard with a fantastic volley but Ben Mensahakes an nice save. 56′- Great interception from Inusah Musah who clears a brilliant cross from Sharani. 57′- Hearts gradually coming under the bullet. 58′- It’s the turn of Hearts now. Dauda finds Morten who sends a long one in but Daniel Kordie is unlucky this time. 61′- PENALTY! Ben Mensah whacks Eric Gawu who tears away from the Hearts defence beautifullyand Referee Isaka Afful couldn’t have missed it. A chance for Dreams FC to take the lead. 82′- RED CARD: Inusah Musah gets a second yellow card and takes an early shower. 86′- Brilliant save from Isaac Amoako from an equally brilliant t cross from Isaccharine Mensah. 88′- Dreams FC defendinlooking well and still pushing for a shocking additional goal. 90+3′- Free kick for Hearts as Sharani a high boot on Morton. 90+4′- Corner kick for Hearts. Wasted!